Amateur TV originally started in the 1920’s but really didn’t take off until the 1950-1960’s. In the mid-1960’s is when Tom decided to start a side business out of his garage. In the late 1970’s, Tom took his business full time and continued with it until he retired and closed his business in 2014. 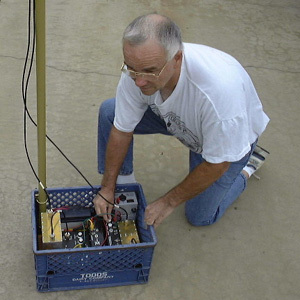 Tom continues to maintain his website and helps other hams with ATV questions to this day. ATV can be used for numerous different things. Things like EMCOMM and Public Service Events, Radio Controlled Vehicles like we talked about back in Episode 70, to high altitude balloons, and anything you can think of in between. Check out his website for more information about all things ATV as well as the kh6htv.com website. There is loads of information listed on both of them about this aspect of the hobby. kh6htv.com – This is a site by Jim Andrews, KH6HTV. On it your will find loads of information about ATV, and escpecially digital ATV. He also has a bunch of ATV equipment that he has built that is up for sale on his site too. batc.tv – This site is a streaming media portal that has several different ATV repeaters linked to it. Every Tuesday evening at 7:30 pm Pacific/11:30 pm Eastern, there is an ATV net that you can watch. If you are a licensed ham and you have some questions about Amateur TV, Feel free to contact Tom directly and he can answer any question that you might have.